Discover Luna Nueva and Book Your Holiday! Villa Luna Nueva is nestled in the hills directly above Cabo San Lucas in the exclusive, private, gated community of Pedregal. It is the perfect spot for those looking for privacy. Beside the unique atmosphere and charm of Pedregal, its proximity to Cabo is the real benefit. From Villa Luna Nueva to the center of town is only 1.5 miles. You can quickly descend upon downtown Cabo and all of its festive day time action and popular beaches or its splendid array of nighttime dinner and dancing. You can easily take a short cab ride without the hassles of driving or parking. Within a few short minutes you can be at the door step of one of the finest restaurants in North America or the best night clubs in the entire world. 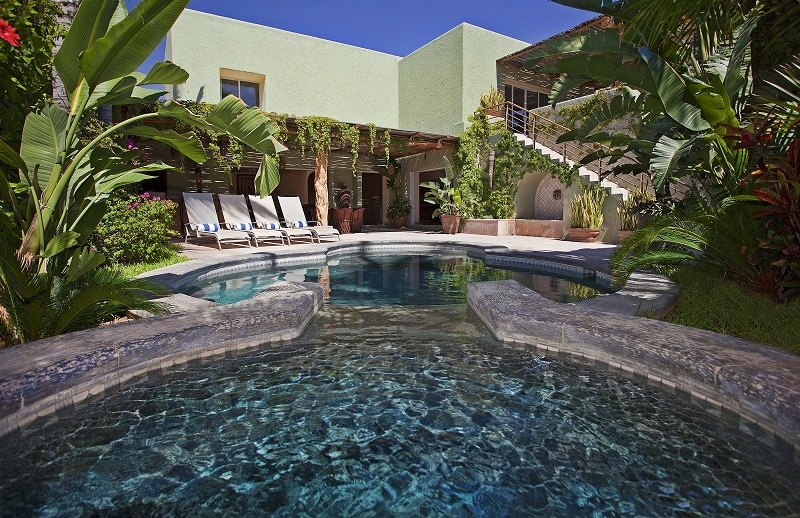 Villa Luna Nueva is perfect for lazy days of sunning, swimming and sipping margaritas. Relax by the pool and indulge yourself with in-house massages or facials. When night falls, fire up the BBQ for a real fiesta or have a private meal prepared by one of our local chefs. Later, enjoy a dip in the private jacuzzi. The outside patio is accented with lights and decorations imported from Guadalajara. The ambience at night is stunning with the living room and dining room both opening up to the patio. The large pocket doors allow for true indoor/outdoor living. The evening atmosphere is so enchanting that many decide to forego the short trip into town and enjoy dinner on the patio. Villa Luna Nueva is the ideal romantic spot. Once you enter through the doors, you will instantly feel at home.